In the heart of the ninth century, ferocious men wielding swords and gleaming axes dare face a massive Crusader force. 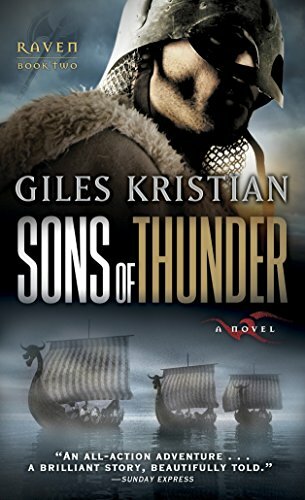 And in Giles Kristian's thrilling series, history comes alive as vividly as the crash of clashing steel. The Norsemen have come across the Channel, up a winding river in the land of the great Frankish emperor. In the belly of their fearsome dragon ship, beneath warriors and weapons, is a book wrapped in cloth, guarded by an English monk who alone knows the true worth of his prize. And by the side of their leader is Raven, with a blood spot in his eye and magic in his soul. Accompanied by the woman he loves, Cynethryth, runaway daughter of an English king, Raven is plunging into an epic clash of men and faiths. "A brilliant story, beautifully told." --"Sunday Express"
"Gripping . . . splendidly conjures up the sounds, sights, and smells of Dark Age Britain." --Harry Sidebottom, author of the Warrior of Rome series, on "Raven: Blood Eye"